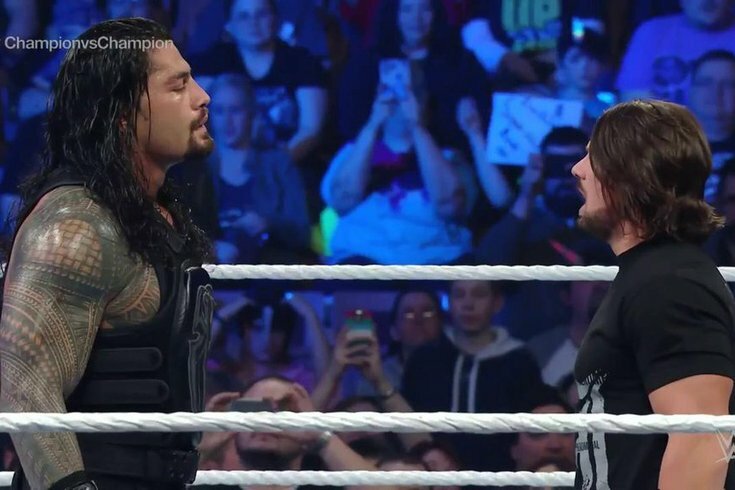 Roman Reigns and AJ Styles came face-to-face on Thursday night before Luke Gallows, Karl Anderson and The Usos got involved. Manchester, N.H., was the site for the last show before Payback on Sunday evening. The Verizon Wireless Arena hosted the festivities for SmackDown, and it featured one of the best endings to a television program before a pay-per-view I’ve seen in a long time. Teasing physical interaction between the main eventers was brilliant, and the storyline has been brilliant. The New Day took over commentary and Apollo Crews is quickly ascending with some great matches. This Smackdown was, in one word, awesome. All in all, the future looks bright. I have to admit, I really am digging the Ambrose Asylum lately. They’ve been very entertaining. I like the other “talk shows” also, like Miz TV and the Highlight Reel. It’s nice to be able to appreciate entertaining professional wrestling and not be critical of it all the time. You can read my Payback preview right here. Oh, and Eric Young debuted with NXT during their television tapings. No big deal. With Payback only days away, WWE World Heavyweight Champion, Roman Reigns, took aim at his challenger, AJ Styles, and basically called him a liar in regards to not having anything to do with Luke Gallows and Karl Anderson attacking him and his cousins, The Usos, in recent weeks. The WWE Intercontinental Champion, The Miz, along with his wife, Maryse, would interrupt Reigns, leading to the night’s main event. Styles came to ringside for the main event to scout his opponent at Payback. Reigns won with a spear, and Styles entered the ring for a face-to-face confrontation with the champion before his buddies, Anderson and Gallows, came out to attack Reigns. Styles didn’t seem too pleased that his boys were attacking Reigns again. The Usos came out to save Reigns, and when Styles was trying to say he had nothing to do with the attack, he got hit with a punch and then Gallows got hit with a superkick by Jimmy Uso. Styles recovered quickly and got a head kick in to Jimmy, but missed a Phenomenal Forearm attempt. Gallows cleared the ring before taking a Reigns spear to save Styles from that same fate. Styles tried to get in a Styles Clash, but Reigns countered and was about to hit him with a Superman Punch but Styles quickly got out of the way. I love the way they’ve been building to this match. Very minimal physical activity between the two combatants and teasing big spots. Sunday’s main event could be the best WWE has had to offer all year so far. In Thursday night’s edition of the Ambrose Asylum, the women’s division took center stage as Charlotte and Natalya came face-to-face ahead of their Women’s Championship match Sunday at Payback. Things got heated, especially when Charlotte said Natalya was crazy for having her uncle, Bret Hart, “parade around” in his condition, especially after he just began his battle with prostate cancer. Natalya retorted by calling Ric Flair a lying, screaming, creepy old man who has to cheat to help Charlotte win because she’s not good enough to do it on her own. Shots fired! And she added that her uncle would be there to prevent Flair from helping Charlotte cheat to win again. This angle is really good, despite nobody thinking Natalya has a shot to win the Women’s Championship. Could WWE try to be unpredictable and have Natalya win Sunday? Enzo Amore and Colin Cassady had a win over Social Outcast members Bo Dallas and Curtis Axel on Thursday night via the Rocket Launcher. However, some think the WWE World Tag Team Champions, The New Day, may have overshadowed the match because the trio was on commentary during the entire match. I’m not one of those people. The New Day on commentary was gold, and with Enzo and Cass and The Vaudevillains also building to this No. 1 contender’s match with promo after promo, there’s nothing wrong with more mic work from the best act in WWE today. Hopefully, they’ll take over the commentary again during the No. 1 contender’s match at Payback. The League of Nations disbanded on Thursday night, in rather quick fashion. Despite a backstage promo before their six-man tag team match against Kalisto, Sami Zayn and Cesaro – full with new T-shirts for each Sheamus, Alberto Del Rio and Rusev – the trio’s demise came when Rusev decided to tag himself into the match when Del Rio was on the offensive. Del Rio left the ring and left Rusev and Sheamus in what essentially became a handicap match. The two tried a double team move, but Zayn moved out of the way and Sheamus hit Rusev which caused those two to begin shoving each other back and forth. Rusev left the ring and then eventually, Sheamus left the ring, giving Kalisto, Zayn and Cesaro the win. Sheamus, Del Rio and Rusev then got in an argument backstage and officially disbanded. Apollo Crews has all the tools to become one of the most impressive superstars in WWE. He’s slowly making his ascent since being called up from NXT after WrestleMania. After his win against Stardust on Thursday night, he talked about that match being his most challenging in WWE to date. Is he next on the list for Reigns, or is it too early to give him that spotlight? •	Six-Man Tag: Kalisto (c-US)/Sami Zayn/Cesaro d. Sheamus/Rusev/Alberto Del Rio by count out after Sheamus left the ring. The League of Nations disbanded after the match. •	Baron Corbin d. Damien Sandow by pinfall via the End of Days. •	Enzo Amore and Colin Cassady d. Bo Dallas and Curtis Axel by pinfall via the Rocket Launcher. Both New Day and The Vaudevillains came out before and during the match. •	Apollo Crews d. Stardust by pinfall via the spinning sit-down powerbomb. •	Non-Title: Roman Reigns (c) d. The Miz (c-IC) by pinfall via a spear. Styles was at ringside for the match. After the match, Luke Gallows and Karl Anderson attacked Reigns. The Usos came out for the save.